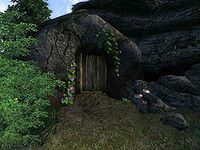 Sandstone Cavern is a medium-sized cave northeast of Kvatch containing monsters (quest-related). 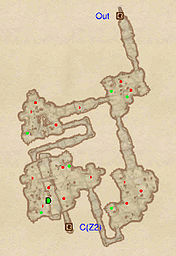 It contains two zones: Sandstone Cavern and Sandstone Big Rooms. The Sunken One: Find the owner of an abandoned farmhouse. This cave can be entered and fully explored without starting the related quest; if you do, everything related to the quest will be gone. The Sunken One will respawn and is therefore an unlimited source for Void Salts. This cave contains 6 Cairn Bolete plants and 12 Wisp Stalk plants. 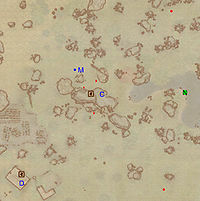 This location's map marker (M on map) is named Sandstone Cavern (editor name SandstoneCavernMapMarker). The entrance door is SE of the marker, 60 feet away. Upon entering Sandstone Cavern, you quickly find yourself facing an intersection. The western tunnel gives you quicker access to the next zone, but for the most effective exploration, choose the southern path. A chest with minor loot await in the first big room; proceed in a southern direction and emerge on the upper-level of another large room with an underground gap in the middle and a bridge giving access to the other side. Loot the chests and jump down into the gap. During the related quest, you will find Slythe's Journal, page 2 on top of the chest at D. Proceed in a southern direction, which will take you to door C, leading to Sandstone Big Rooms. 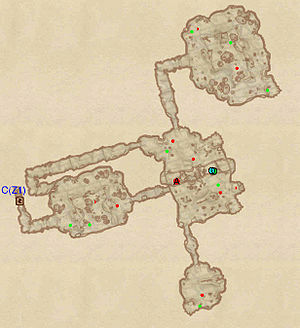 When you return later from door C, simply head north and loot the last chest in the northwestern room, then follow the tunnel heading east and exit the zone via door Out. If you have initiated the related quest, your reward is within reach. 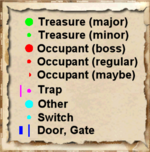 You arrive in this zone from the only entrance at C and will soon find yourself in a larger room with a bonfire, a chest with valuables and two routes to choose from. For the most comprehensive search through this cave, choose the longer path and proceed through the northern tunnel. Dispose of the monsters in the next room and head north; eventually you will end up in a large dead-end room with three chests. Backtrack to the previous room, jump over the pit and investigate the southern tunnel for another dead-end room. Once again, backtrack and jump down into the pit where you will locate the lifeless body of Slythe Serengi and the Offering he brought to the cave. 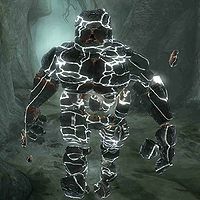 Searching his body will net you page 3 of his journal and an encounter with The Sunken One, a special leveled variety of Storm Atronach. After the battle in the pit, proceed west and emerge in the first larger room of the zone, and easy access to door C, leading you back to the first zone, Sandstone Cavern. This page was last modified on 25 March 2018, at 03:11.